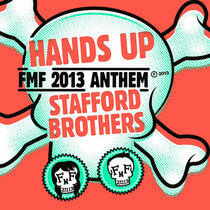 Australian dance music duo, the Stafford Brothers, have been commissioned to produce the Official Future Music Festival 2013 anthem, ‘Hands Up’, released via Future Music / EMI / Universal this week. Each year the brothers are the official hosts of the main-stage of Future Music Festival playing alongside and presenting artists such as Skrillex, Swedish House Mafia, and Fatboy Slim, among others. Following the release of their their first single, ‘Hello’ with Lil Wayne and Christina Milian, on Cash Money Records, in ‘Hands Up’ they begin with an introduction of the overtones matched with the spliced, pitched-up vocal sample and a stuttering synth line for added texture. The anthem then builds up into a crescendo that drops into a stimulating progressive house section with bright emotive melodies and a side-chained, gritty bassline. It’s out March 14.